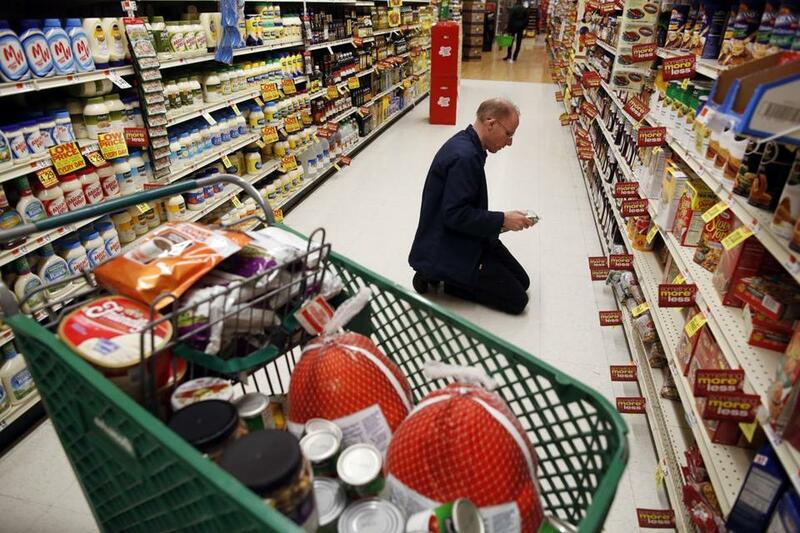 Scott Macaulay shopped for Thanksgiving groceries ahead of the dinner he has cooked for 28 years in Melrose. MELROSE — Think you had a lot to do before Thanksgiving? Consider what Scott Macaulay was up against. “Hell week,” said Macaulay, who fixes vacuum cleaners for a living. It’s not just that his customers, in the throes of housecleaning, have suddenly noticed their vacuums are broken. Macaulay is also expecting nearly 70 people for Thanksgiving dinner, an annual extravaganza that he organizes, pays for, cooks, and serves, almost all of it by himself, a tradition he started when his own family was divided by divorce. This is the 28th year that Macaulay, 52, is hosting Thanksgiving at a Baptist Church in Melrose for people who have no other place to go. They might be widows, or new arrivals to this country, or poor. Some are simply lonely, like the elderly woman with Parkinson’s who arrived one year in an ambulance from a nursing home. The drive cost her $200 “plus mileage,” Macaulay said. There was the young woman from New Hampshire who came by herself because her father was hospitalized in Boston. The husband and wife who had lost their jobs. The man who comes on the years his brother won’t invite him. The blind girl who came one time with her father. He means this literally. Every year, Macaulay fashions a living room-dining room tableau inside the First Baptist Church fellowship hall. He hauls in a fake fireplace and fake wood stove, and arranges wing chairs and rocking chairs around them on an Oriental rug. There are cloth tablecloths and napkins, hors d’oeuvres (which he likes to call “horse ovaries”), candles, and bouquets of fake flowers. Still, he’s never skipped a dinner, not the year with the ice storm, not the year he passed out while driving, had a car accident, and was rushed to the hospital, where he got a pacemaker. He didn’t even cancel it this year, after getting word last Friday that the church ovens were broken and wouldn’t be fixed on time. He simply arranged a late switch to the Green Street Baptist Church, hauling the fake fireplace a mile and a tenth on a dolly along Main Street in Monday night’s freezing cold. That was in 1985, the year he was 24 and his parents split up, acrimoniously. If he was nice to one parent, the other one got angry, and as Thanksgiving approached Macaulay started to feel “pretty desperate.” That’s when he got the idea to put an ad in the Melrose Free Press. The First Baptist Church in Melrose let him use the fellowship hall, and about a dozen people showed up. Dinner was a success: He didn’t burn anything, no one got sick, and people generally had a good time. “I was probably a little nervous about it,” he said. “But Thanksgiving dinner is the most basic meal anyone can cook. You get a turkey and all the directions are on the bag. The squash and potatoes, you just peel and boil. You can’t screw that up,” he said, punctuating his sentence with his typical gleeful cackle. He’s kept the tradition going (the invitation is still an announcement in the Free Press) though for a short time he hosted it at his own house. He was married, briefly, to a woman “who absolutely hated it,” said Macaulay, who has a 17-year-old son. “One of the ladies knocked over three of her goblets in the kitchen, and that took care of doing it at the house,” he said. The largest crowd he’s had was 89 people. He’s refined and expanded the menu over the years; it now includes frozen meatballs as the hors d’oeuvres and canned fruit cocktail with a daub of pink sherbet. Macaulay is a curious blend of saintly and crotchety. He volunteers at five different churches, and lives a pared-down life: no computer, cellphone, television, or dishwasher. He wears “raggy” clothes; this day it’s a loud plaid shirt, worn pants, and shoes with holes. His hair is sparse and has a tendency to stand up vertically, almost as though it’s been vacuumed up. His base of operations is Macaulay’s House of Vacuum Cleaners, a narrow repair shop which he lives atop. It’s a jumble of Orecks, Hoovers, and Electroluxes. Ironically, it could use a good vacuuming. The shop is a multipurpose dropoff point: He collects eyeglasses for people in Africa, clothing for battered women, canned goods for food pantries. 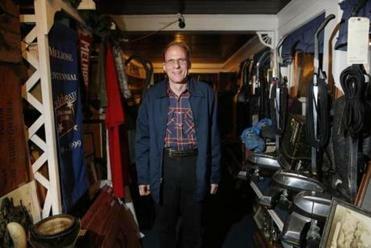 He is so concerned about people who are homeless, especially veterans, that he’s twice taken to living on the street in Boston to gain a understanding of their experiences. His goal at Thanksgiving “is to have nobody sign up” for dinner. That means everyone’s got a place to go. This is Macaulay’s irascible self. A lot of things get under his skin, including the amount of “work and aggravation” that goes into preparing his dinner. “I wonder why I do it sometimes,” he said. He requires people to make reservations by the Monday before the holiday, though a lot of people show up without them. “What hurts me more than anything else are people who make reservations and don’t show up,” he said. But he saves his worst ire for “The City,” by which he means Melrose. Things were going along fine until 2010, when Macaulay’s Thanksgiving dinner unexpectedly took on a much higher profile. He was invited to share the story with “StoryCorps,” the national oral history project. It was broadcast on National Public Radio’s “Morning Edition” and has been anthologized in “Ties That Bind,” a collection featuring the best stories recorded by StoryCorps over the past 10 years. “That’s when City Hall messed things up for me,” he said. “Suddenly there were all sorts of rules and regulations.” He needed a permit. He had to wear a hair net under his turkey hat. He’s not allowed to nibble while he’s cooking. He can’t cook the turkey stuffed. The food needs to be served in chafing dishes. “That cost $200 extra,” he grumbled. On the other hand, Macaulay knows the dinner is appreciated. He recalls that the woman who arrived by ambulance began to cry when it was time to go back to the nursing home. Macaulay once got a call from a funeral director who was helping a family prepare for a funeral. They had been talking about how the dead man’s last outing was to Macaulay’s Thanksgiving dinner, and how he’d had such a wonderful time. Macaulay recalled the man was quiet, and that he nodded off in front of the fake fireplace.